We’re not quite the Civil War buff that Craig is, but we do find it, and museums about it, interesting. Especially when they have a cute redhead intern to display the artifacts. The Gettysburg Museum of History is a private museum, which you may have seen featured on American Pickers. If you “like” them on Facebook, you can peruse hundreds of pictures of some really interesting artifacts, both Civil War and from other periods. And most of them feature Vanessa. This will also serve as a firearms recognition quiz. Yes the monument for the 20th Maine Infantry Regiment. Most visitors would stop there, then head back to the car. But as anyone who has read Killer Angels will recall, there was more to the story. When the 20th’s commander, Colonel Joshua L. Chamberlain, first arrived on Little Round Top the afternoon of July 2, 1863, he sent Company B to deploy as skirmishers on his left. Forty men under Captain Walter Morrell. These men were arguably the left flank of an army. They deployed along this stone wall. Alabama troops attempted several charges up those slopes. But Chamberlain held. In the confusion, he had to assume Morrill was lost. With no reinforcements and limited ammunition, Chamberlain opted for a desperate charge down the slope. When that charge wheeled down, Morrill’s men rose to deliver shots into the rear and flank of the Confederates, then joined the charge. I could go on about courage, leadership, and decisiveness on the battlefield. But you’ve probably already heard that lesson. Heck, I just think it’s six kinds of cool that I’m typing this and adding photos while standing on the actual ground! 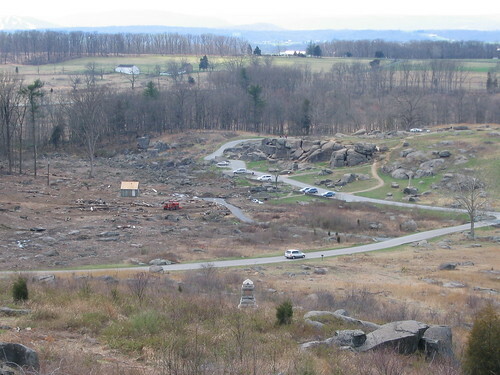 Gettysburg: Standing on Little Round Top looking down into The Devil’s Den… Surprising! Pictures and maps do NOT make clear the proximity. Antietam: Looking down at Burnside’s Bridge from the position of the Confederates… Shocking. I agree. I’ve visited both locations countless times. I always step away in awe of what brave men on both sides did in those battles. As said in the post, the camera just can’t give you that same sense of proximity at the Devils Den. Even with the zoom on. This is musket range, perhaps a bit on the high-end, for the time. This view also points out the declination between the two points of ground. Federal cannoneers on Little Round Top had a tough time depressing the tubes to bear on the Confederates advancing up Little Round Top. To the side of the location where this photo was taken stand four Parrott rifles representing Charles Hazlett’s Battery D, 5th US Artillery. Guns like those could, and did, make life difficult for the Confederates. The Parrotts could range well beyond the Devils Den to the farm houses beyond. So in one view, you might appreciate at once the compactness and the depth of a Civil War battlefield. And, by the way, Hazlett was among the many Federals who died in the defense of Little Round Top. Heading over to Antietam. 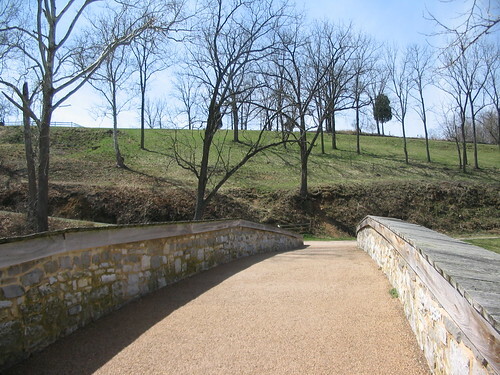 Walking across Burnside’s Bridge, you are walking the footsteps of those who fought in the battle. Some time back, I wrote at great length about the military particulars of the Burnside Bridge crossing. I really need to update that post with links and map depictions of the referenced movements. But long story short, the passage over this bridge might seem ill-advised, but military necessity required the crossing. There are certainly things the commander could have done better. But regardless, this bridge had to be taken. Because we can indeed walk in their footsteps we can better consider how the men tasked with the crossing accomplished the feat. My intent here is not to show off photos from my battlefield stompings, rather to point out some of the lessons one might learn walking the ground. 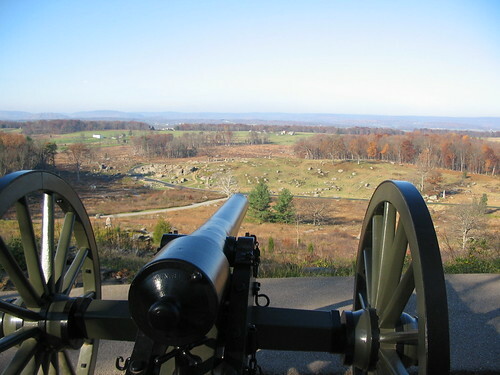 Congressional acts set aside both Antietam and Gettysburg as “national military parks” in the 1890s. In part, those acts created memorials to the veterans who fought in America’s Civil War. But the acts also expressly aimed to create “classrooms” for the nation’s military to study the great battles. Some might argue those classrooms are obsolete in the days of high technology and asymmetrical warfare. Then again, these old classrooms might have a few more lessons to offer.